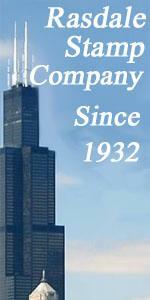 They are plain hand carried covers, but that is how they are most often found. One is marked “Offi ial” at the upper left corner and was carried by military courier. 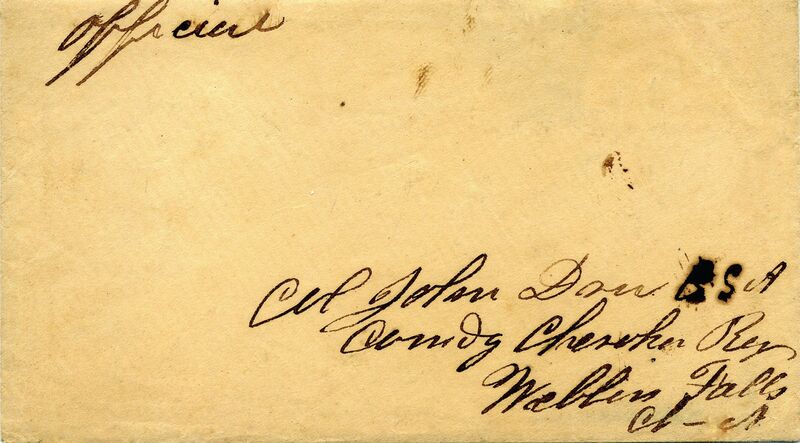 It is addressed to “Col. John Drew CSA, Comdg Cherokee Reg Webbers Falls CN” (Cherokee Nation). 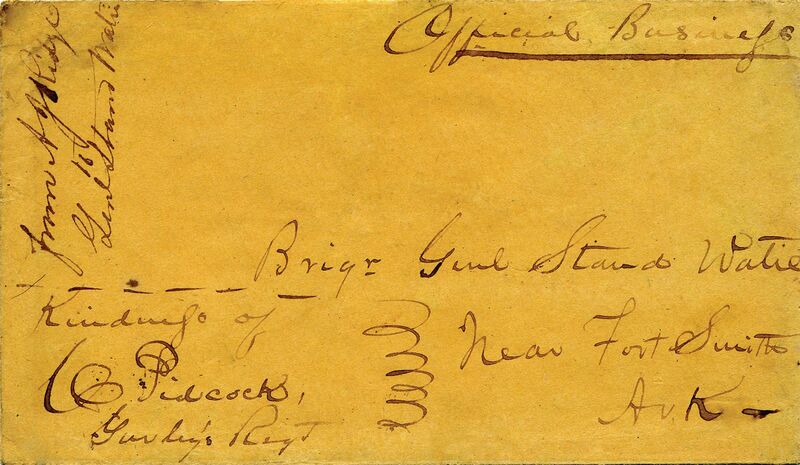 The other cover, representing the other side of the dueling Cherokee nation, is addressed to Brig. Gen. Stand Watie near Fort Smith, Ark(ansas), also hand carried and noted “Official Business”. These were both owned by the late Gordon Bleuler whose collection was sold recently. Even before the fledgling Confederacy was formed, in the Indian Territory there was a long standing issue brewing. Keeping whites out of the Cherokee Nation inthe East was clearly hopeless, especially after gold was discovered on Cherokee land in 1828 and President Andrew Jackson refused to enforce the Supreme Court’s Worcester v. Georgia decision in 1832 in which it was held that Cherokee Native Americans were entitled to federal protection from the actions of state governments which would infringe on the tribe’s sovereignty. Consequently, some of a Cherokee leaders supported removal to the West. On December 29, 1835 they signed the Treaty of New Echota giving up all claims to lands in the East in return for compensation and land west of the Mississippi River. Other Cherokees, led by Chief John Ross, bitterly opposed the treaty and fought removal, but the U.S. Senate ratifi ed the treaty and the U.S. enforced the Cherokee removal known as the “Trail of Tears”. In 1861, Principal Chief John Ross tried desperately to keep the Cherokee Nation out of the white man’s war; he urged neutrality. But the Union abandoned all Indian Territory military posts in the spring of 1861, violating treaty pledges and making the area vulnerable to Confederate attack. By the end of the summer, alliance with the Confederacy became the only rational course of action.A treaty was negotiated but, in spite of the alliance, the Cherokee had no affection for the Southern States who had forced them from their homeland in the East. The Cherokees formed a secret society called “Kee-too-wah” or “the pins”, because each member wore two common pins in the form of a cross, representing war pikes, on the coat or huntingshirt. The “pins” were mostly full-bloods, and the society was organized mainly to encourage the people in keeping up the old tribal customs and to prevent their taking up the ways of the whites. Few of the full-bloods owned slaves, though some did. The head of the “pins” regiment, Col. John Drew, was a slave holder. Drew was also married to Chief John Ross’ niece. In December, many of the full-bloods in Col. John Drew’s Second Cherokee Mounted Rifl es had deserted to avoid fighting against Opothleyahola’s Loyal Creeks on their exodus to Kansas. In July 1862, Union troops occupied the capital city of Tahlequah and, after some negotiation, Chief Ross was voluntarily captured. 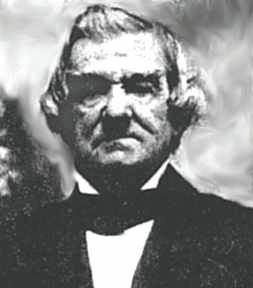 Ross traveled to Washington to try to convince President Lincoln that the Confederate Treaty was signed under duress and the majority of Cherokee were loyal to the Union. The National Council rescinded the Confederate Treaty and emancipated slaves in the Cherokee Nation. However, it was another year before Federal Troops effectively controlled the Cherokee Nation. The Nation was essentially a noman’s land. 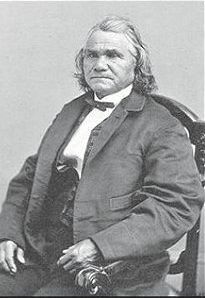 With the outbreak of the Civil War, Stand Watie, a wealthy Cherokee planter and slave owner in the Indian Territory, sided with the Confederacy and was commissioned as a colonel in July 1861. His regiment was the First Cherokee Mounted Volunteers. Watie and his troops, together with all other forces in the field fighting for the confederacy, refused to accept the action rejoining the Union. This faction, still true to the south, promptly declared that it represented the real Cherokee Nation and proceeded to form a government, choosing Stand Watie as principal chief in August 1862. From this time until the close of the War Betweeen the States, there were really two Cherokee nations. One, claiming John Ross as its executive head, had left the Confederacy. Each claimed to be the real Cherokee Nation and asserted that the other one was only a rebellious minority. On June 29, 1995, the U.S. Post Office issued a set of twenty commemorative stamps showing people and battles of the Civil War. 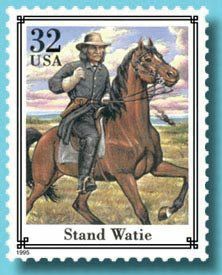 One of the stamps shows Stand Watie on horseback after a raid. On June 23, 1865, over two months after Lee’s surrender, Cherokee Stand Watie became the last Confederate general to surrender his forces.